The world’s largest geta (Japanese sandals) aren’t made for walking. Nor are they any good for climbing. But for the intrepid day tripper from Tokyo, getting to Daiyuzan to see them is well worth the trip. Daiyuzan Saijoji is a 600-year-old complex of more than a dozen Buddhist temples nestled in the mountains north of Odawara in Kanagawa Prefecture. To reach the temples from Odawara Station, take the Daiyuzan line to its terminus, Daiyuzan station, and set out on foot (there is bus service, but where's the fun in that?). Head south on Highway 723, walking first through the town of Minami Ashigara and -- as the road begins to ascend -- passing through a stately red temple gate housing two ferocious Nio guardian kings. Beyond, leave the road for a well-maintained trail into a forest of tall, straight cedars, some more than four centuries old. The trail winds through the tall trees, ever climbing, sometimes even using stone stairs to facilitate the ascent. The forest canopy lets through only dappled sunlight, creating a palette of green and brown hues that bring a sense of relaxation and calm. One can feel the energizing negative ions in the air! The temples of Daiyuzan are known as a home of Tengu, the mischievous mountain spirit and messenger of the gods. One of Tengu's symbols is his feathered fan, which he uses to create the gale-force winds on which he flies. Stylized images of Tengu's fan appear in many places along way, including lamp posts, railings, and street signs. Eventually stairs lead to a footbridge over a fork in the road; a couple of hundred meters beyond, as the trail draws closer to the road, a separate dirt track leads off to the right. Remember this spot, you'll need to return to it later. Even though the trail is close to the road at this point, the thick forest and lack of traffic contribute to the sense of remoteness. A small shop comes into view with signs declaring this is "Stage 18". How many stages are there, one wonders. A bit further on another wide spot in the road comes into view, this one labelled "Stage 22". This is the end of the line for the bus service from Daiyuzan Station. A pair of huge stone lanterns and a staircase beyond indicate the start of the temple precincts. Stop here to check out the souvenir shops selling the local delicacy, waffle crackers in the shape of Tengu's feathered fan. Even the public phone booth is adorned with Tengu's fan, as is the small clock tower across the road, the clock face identifying the hours according to the Chinese zodiac. Behind the clock, a creek can be heard but not yet seen. In spite of the feeling of having arrived, there are still more stone stairs to climb before any temple buildings come into view. 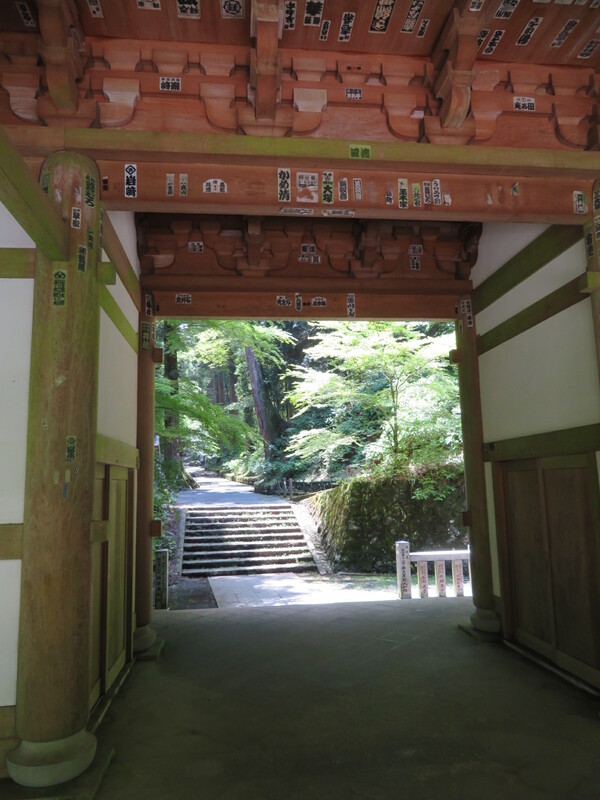 The first building is another gate, this one enormous and elaborately constructed, but unadorned, except by senjafuda, those white slips of paper bearing the name of a pilgrim who has pasted it on the gate to commemorate his or her visit, a Japanese version of "Kilroy was here." Passing through this gate, the straight laneway beyond, still flanked by cedars, beckons one to hurry along. "You're almost there," it seems to be saying. A 90-degree turn to the right and one more flight of wide stone steps leads to a smaller gate which opens onto a courtyard surrounded by half a dozen temple buildings. Around the perimeter of the courtyard are benches and other facilities for taking a break or just admiring the splendor of the buildings. Look closely -- the image of Tengu's feathered fan is embedded in various building decorations from the gables to the shutters. At the far end of the courtyard are a Zen meditation hall, a couple of small ponds and more stairs leading to more temple buildings, beginning with the main temple (hondo) and to the left of that a hut housing a spigot pouring water into a large ceramic jar, again adorned with Tengu's fan. This water is known as kon-go-sui, the golden water of strength; cups are helpfully provided in case you'd like a fortifying sip. Sitting above the walkway is the temple's bell tower, with elaborate carvings of dragons on its supporting pillars. 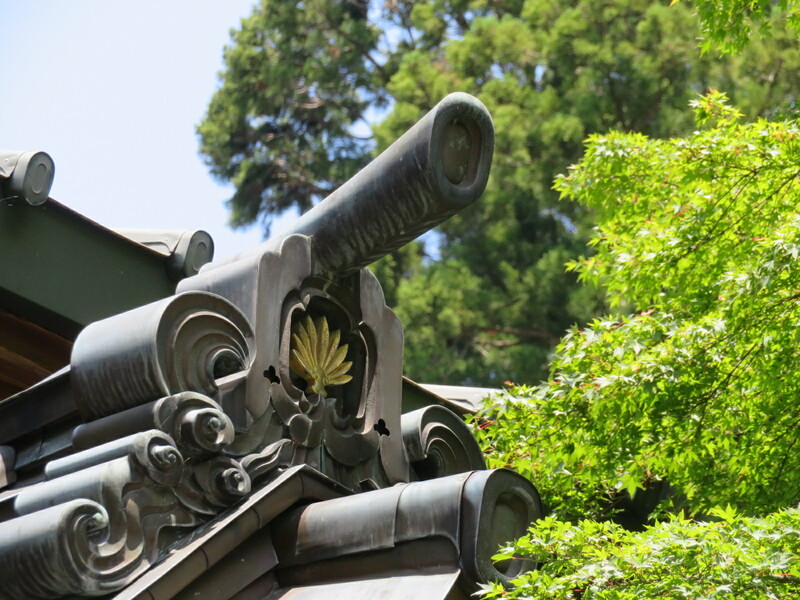 Nestled in the trees above sits a pagoda known as the "treasure tower." Nearby, a tall thin waterfall tumbles over stones to form a brook that makes its way under a broad stone bridge to join the creek below. The falling water creates pleasantly cooling breezes. The bridge leads to another gate, this one guarded by two bronze statues of winged Tengu, one with a bird beak face and the other with a more human face but looking ferocious nonetheless. This human-looking Tengu is carrying a message scroll in one hand and a feathered fan in the other. With his wings spread, he appears ready to take flight. Brave these guardians and step through the gate, only to find another small courtyard and two choices of which way to go next. The tall staircase to the right, though daunting, is recommended. It is at the top of these stairs that one can find the world's largest geta, weighing in at 3.8 tons. In fact, there are dozens of pairs of geta in various sizes and styles laid out here, lovingly guarded by a serene bronze statue of an 11-headed Kannon, the Buddhist goddess of mercy. But wait! There's more. Beyond the geta, another staircase -- this one "just" 400 steps -- leads to Oku-no-in, the shrine that stands guard over the entire complex. Two more bronze Tengu statues keep watch over visitors to ensure their safe ascent. 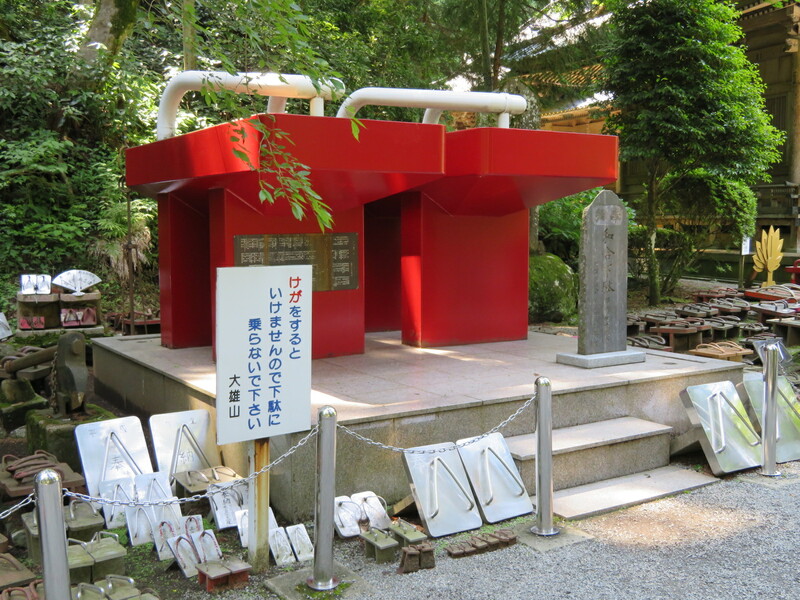 At the top are benches and a much-appreciated water fountain, as well as the shrine itself, adorned with still more images of Tengu's fan. Visitors who make it this far are welcome to remove their shoes and go inside for a quiet, respectful moment with the gods. Or buy an ema (votive plaque) shaped like a geta and leave a message for the gods. Doubtless Tengu will make sure the message reaches them! Behind the shrine, an alternative paved route back down to the main temple complex ensures steady footing for anyone whose legs might still be a bit wobbly from the climb. This trail affords views down the valley over the green roofs of various temple and shrine buildings in the complex. 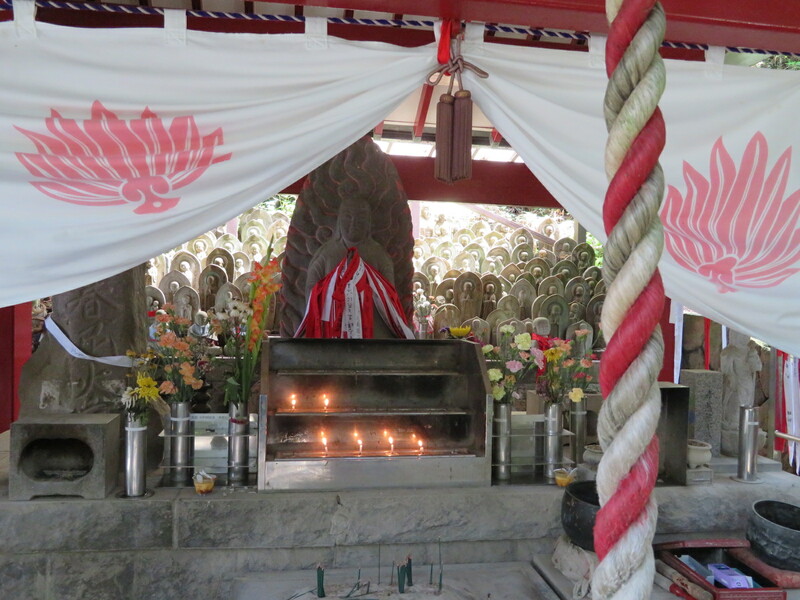 One interesting feature is a small hut filled with Jizo statues. One of jizo's roles is to watch over travelers. 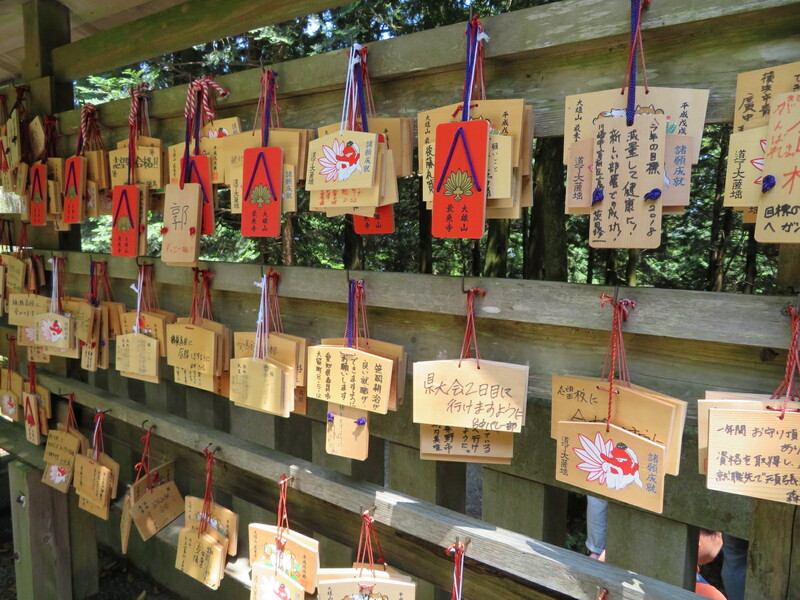 Many red or white pilgrim's belts hang here, perhaps left by pilgrims to thank Jizo for keeping them safe on their journey. Once Daiyuzan's temples have been thoroughly explored, head back down the trail to the dirt track mentioned earlier. In less than 10 minutes, this little trail leads to a side road in the next valley. Follow this road upward to the Only You (オンリーゆー) onsen, a "modern" onsen resort offering accommodation and gourmet meals, but also day bathing. Also nearby is a large camp ground, a small museum, and the Tobi Tengu ziplining course, for those desiring rustic accommodation, a history lesson, or a bit of a thrill whizzing through the tree tops. Only You is nestled in a valley of deciduous trees, offering verdant shades different from those of the cedar valley of the Daiyuzan temples. Day trippers and overnight patrons alike relax in indoor or outdoor baths, or just chill with a good book and a cold drink on the broad deck amidst the forest's canopy. 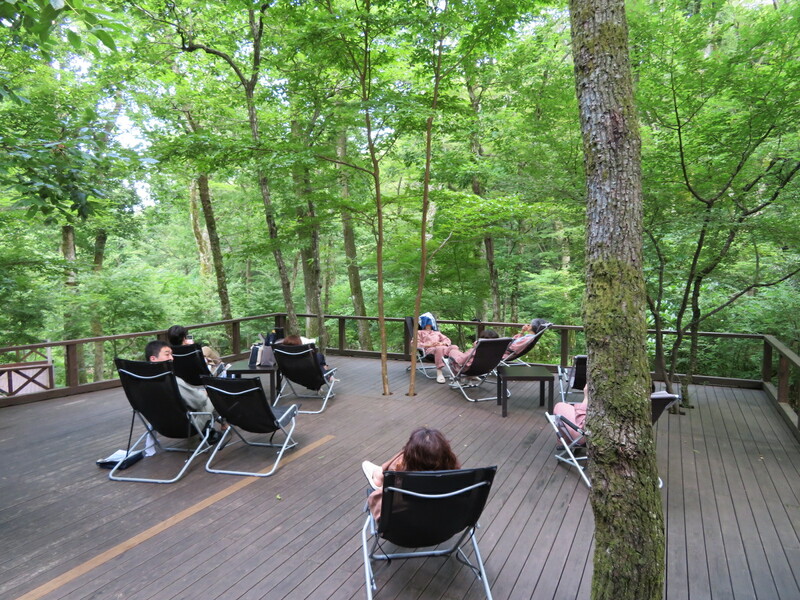 Are they deliberately combining traditional hot springs bathing with the currently vogue forest bathing? Whatever! The senses are both stimulated and satisfied. What a feel good place this is! Having unwound in the bath after a hike to Daiyuzan Saijoji, and with no sign of Tengu's wind-creating fan in sight, the resort's hourly shuttle bus back to Daiyuzan station is the perfect ending to this day trip mountain exploration.